Finally, this terrible week with lots and lots of work for my mum is over! Yihaaaa! So my mum is at home for some time! 🙂 It’s a whole day or something! Lunch on a terrace at the left bank of river Scheldt? That’s allright… I get a treat, yes? A nice bone? Okay, that’s a deal! And afterwards we visit mum’s human pup, who isn’t a pup anymore! 😉 She started a new vegetable garden this year and my mum and dad want to see that, and not only the pictures! But I am a little angry and disappointed! Dogs are not allowed in that garden! Shasta and Goofy (my friends!) can’t go to see the vegetables, neither can I! I get a strawberry? Okay, I’m not disappointed anymore! 😉 Mum, when do you start growing strawberries? I’ll help you, that’s for sure! Kita, we have no garden!!! We greet the world! At least, i do. Hugs, Kita! Lots of puppies!… My help not appreciated! Was taking a sunday afternoon nap when mum got me companians on my blanket. My goodness, look at that! Do you hear it too, mum? No, she doesn’t, until I jump on her plants! She screams! No harm done, luckily! My help is not appreciated, I will continue my nap, outside! I want to play with this very little puppy! Take a nap since my help is not appreciated. You keep musing about your distant Airedale friend that is now at the Rainbow Bridge, Kita, but you don’t really know what you’re talking about, do you, young lady? Want to learn more? As I see it, it’s some sort of gigantic dog-park without enclosures, where us pets can play and run free, never get old, tired or bored, and with lots and lots of treats and toys. I think we might call it The Eternal Hunting Grounds or something. Wow, sounds really exciting! I would like to go there too! Don’t say that, Grandpa Lennox, you’re still going strong! Oh no, very sad news… for Gracie and her family! But now, my far away friend Gracie must be very, very sad! Her big sister went to Grobber. Grobber was my big friend at the dogpark! He went away for never returning, more than a year ago. My mum says he is at the RainbowBridge now. I don’t know where that is but my mum says it is a very nice place for dogs. There is Grobber and now Sadie is there too! Mum, tell Gracie and her humans that tears are not necessary: Sadie is fine at the RainbowBridge. Will you send some kisses from me to Gracie, please, mum? Run free Sadie and will you give some hugs to Grobber too? Busy and little bit strange… this saturday! It started this morning after the playtime in the dogpark. I was tired and wanted to sleep! No way! In the car! ohlalalala… We were going to the place with the people in the green jackets! Oh no! My weight? 23,2 kilograms (55 lbs, 51,1 pounds if my mum’s calculations on internet are correct…). Very well, said the doctor! In the afternoon we went to mum’s hairdresser. She lives in Ranst. That’s a small village at about 12 kilometers from home. My mum lived there as a child and young lady. We were too early and my mum said she wanted me to meet some nice people. Okay, I come: I always want to meet nice people. We stopped at a large stone. Where are the nice people, mum? Mum explained that she had a mum and dad too. And her mum and dad are at the RainbowBridge for many, many, many years. Little bit sad, I think. I closed my eyes a moment: an airedale lady knows when she has to show some respect! After that we passed by the church. Mum also showed me the house where she lived long ago with the nice mum and dad of the RainbowBridge. And then we went to the hairdresser, a very long walk! I like it there: my little friend Suske is so nice! Voor en na… maal twee! Het vrouwtje zegt dat die boom een kraakwilg is. Dat snapte ik niet, maar nu wel! Mijn boom is gekraakt! De hoge stammen zijn een beetje naar beneden gekraakt. En nu durf ik nog verder in mijn boom! Het is en blijft boven het hoofd van het vrouwtje, maar nu is ze toch een klein beetje minder bang, denk ik. 🙂 En nu kan ik alle hoge, kleine takken snoeien! Joepie! Kijkt het vrouwtje? Zal ik in de niet-gekraakte boom klimmen? Ja, ik klim verder in mijn boom… toen nog niet gekraakt! Nu kan ik nog veel verder in mijn gekraakte boom, nog hoger! Zie je het wel? Mijn boom is naar beneden gekraakt! Hihihihihi… hahahaha… snel, sneller, snelst! Zo gaat dat! Loulou heeft een groene bal. Een gekke bal! Een gekke, groene bal met grote, gekke, witte tanden! Ik ben snel, ik ben sneller, ik ben het snelst! En dan gaat het zo: het baasje van Jazzy wil ook de bal! Het grote, beetje gekke baasje van Jazzy wil dus ook de bal. Het baasje van Jazzy komt eraan! Hij wil de bal! Ze roept! Ik ga! Bal in de hand? Snoepje? Snoepje pakken! 🙂 Bal los en in de hand. 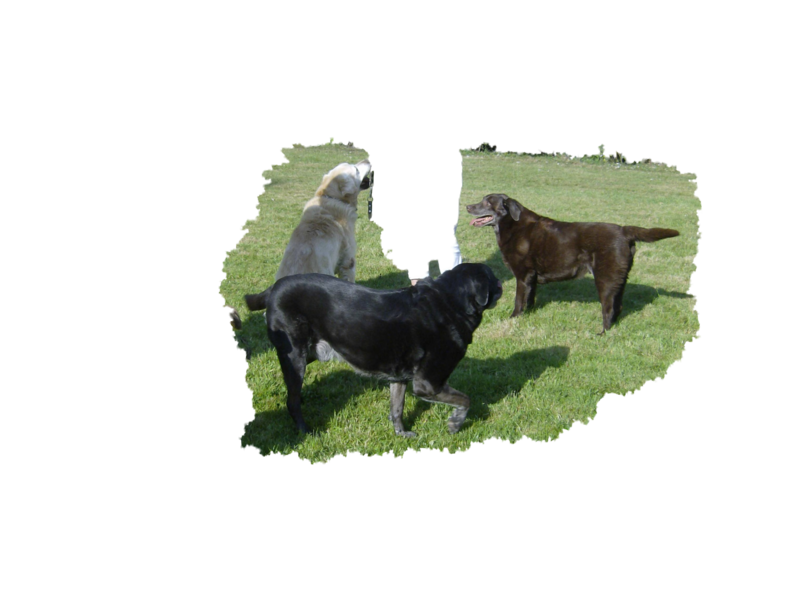 Woofwoof Ina… reading days with Olle! Hey, mum, Loulou is coming in the dogpark too! You see it? Her mum wants you to come! Loulou’s mum takes something out of her bag and gives it to my mum! What’s that? Oh, it’s only a book! 😦 It’s not a treat! But now I see it! 🙂 That’s the book Woofwoof Ina’s mum was talking about on the computer! 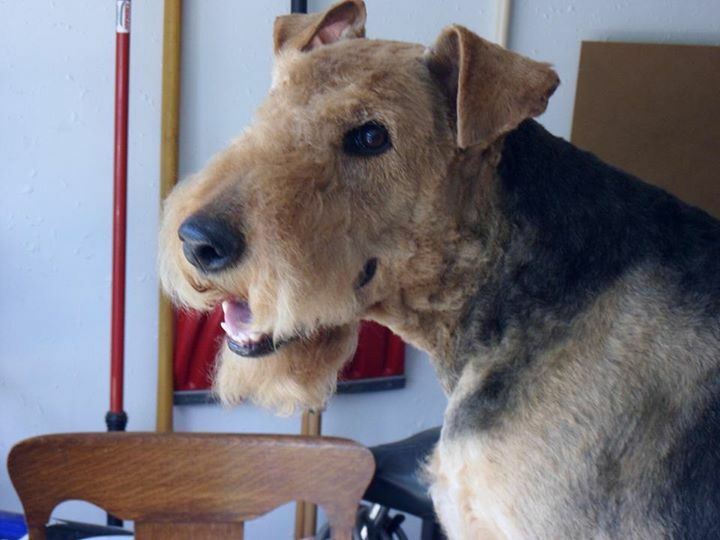 It’s about an airedale sir, Olle! And Olle doesn’t only speak UDL (Universal Dog Language, as Bogie Sherman and Ozzie Airedale call it). No, he can speak in human language too! It’s a book for children, but my mum says that a lot of adults could learn from it! Hé vrouwtje, kijk daar is Loulou ook! Zie je het? En haar vrouwtje haalt iets uit haar tas en geeft dat aan mijn vrouwtje. Oh, het zijn geen snoepjes. 😦 Het is een bundeltje papier! Een boek, Kita, een boek!